Archangel Gabriel's name means 'God is my strength', and will guide would-be parents towards the conception of their child, or trying to adopt a child. She will give strength and courage to the would-be parents and help the expectant mother to stay centred in blissful faith to create the best atmosphere for the child. 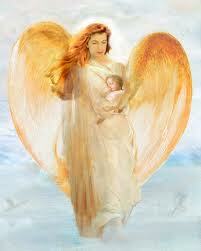 Archangel Gabriel will guide anyone who's life's purpose involves the arts or communication. She is also the angel who told Elizabeth and Mary that they would bear sons, John the Baptist and Jesus of Nazareth. As the messenger Angel, she can help you with writing and help to open the that allow for your articles and books to be published. Just ask her to assist you. As her name means 'God is my strength', call on Archangel Gabriel to help you in times of need; she will ensure you can connect with God's strength at all times; she will help you to tap into this power. Archangel Gabriel's aura is copper and you can connect with her by using a piece of Citrine or the metal copper. Shop for Citrine and Copper Nuggets.